The Berbers are a cluster of peoples who live in North Africa and in the northern parts of the Saharan countries of MALI, NIGER, and MAURITANIA. The Berbers have their own languages, which belong to the Hamitic or Afro-Asiatic language family, and they write in their own scripts. The native people of the region, the Berbers resisted the Arab conquest of North Africa in the A.D. 600s. Eventually, though, they accepted Islam, the religion of the Arabs. During the 700s the Berbers took part in the Arab conquest of Spain. A few centuries later, they established the Almoravids and the Almohads, two of the Islamic empires that ruled North Africa and Spain. During the 1800s the Berbers fought against French colonization in Africa. 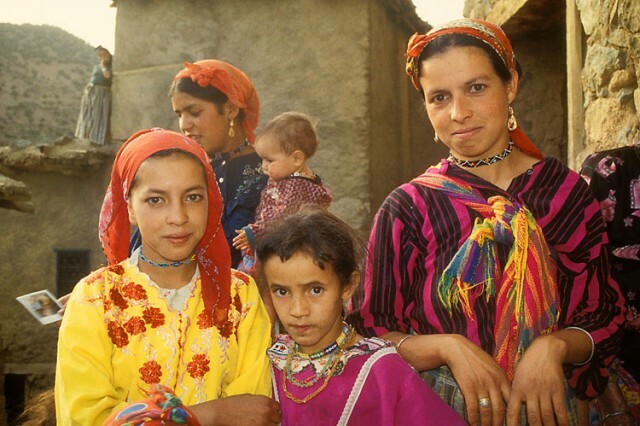 With a estimated population of more than 12 million, the Berbers consist of at least 200 groups or tribes. The Kabyle, Rif, and Shluh are the largest of the Berber groups. The desert-dwelling TUAREG are among the best known. Traditionally the Berber economy depended on the herding of livestock, especially camels, and the farming of grain. Some mountaindwelling Berbers on the fringe of the Sahara desert continue to graze livestock, moving seasonally to provide their herds with water and pasture. Most Berbers, however, live in rural settlements or small towns.